This vibrant mural design by Charles Baskerville for A Jaguar Hunt in a Mexican Jungle presents an imagined vision of a lush, foreign environment. 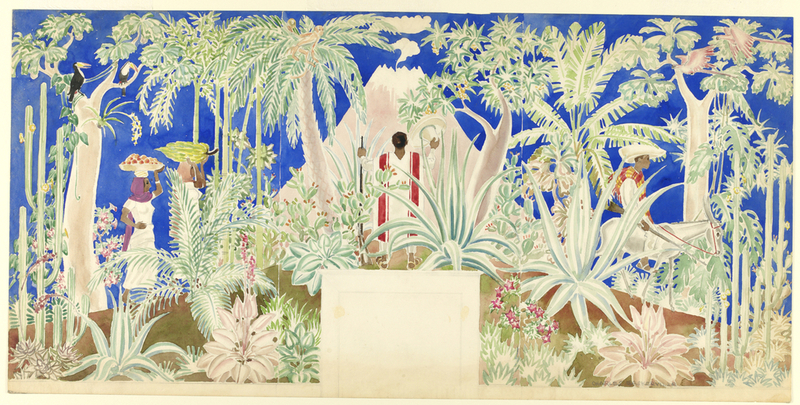 Part of a group of studies for the pool house (called the Mexican Pavilion) at the Cornelius Vanderbilt Whitney Estate, the eight-hundred-square-foot mural transported Long Island residents and guests to a warm, exotic landscape. The fantastic poolside pavilion provided a perfect setting for gaming, lunching, and lounging. Featured in the April 1936 issue of House & Garden magazine, the pavilion was described as being perfect for hosting parties. Though Baskerville had traveled widely as a portrait painter, this vision of Mexico is based on fantasy rather than realism. The wild plants that fill the landscape resemble a beautiful botanic garden rather than an actual jungle scene. Other aspects of the Whitney Estate highlighted the fantasy—Whitney owned a ranch in Mexico, from which the family would bring back animals, such as a white mule, to the Long Island home. Baskerville’s continuous design also pays careful attention to the pavilion’s architecture. In this drawing, a large smoking volcano dominates the center of the wall above the fireplace. In other studies, jaguars and monkeys crouching in treetops are placed directly above the arched openings for windows and doors, creating a view that would combine the exteriors of the Whitney Estate with exotic foreign fauna. The four designs for the mural work together to tell the narrative of a jaguar hunt. On one wall, a male figure in traditional Mexican clothing aims a rifle at a jaguar in the trees. In another scene, two men carry the slain jaguar. Women in bright clothing carry tropical fruits in baskets. Though this depiction of a tropical country and its people is a fantasy, Baskerville’s commission came at an important time for relations between Latin America and the United States. The US government implemented the Good Neighbor Policy in 1933, establishing friendly relations between the US and Central and South American countries. This led to an influx of American tourism in Mexico and a vogue for Latin America, evidenced in popular figures such as Carmen Miranda. Julie Pastor is Research Cataloguer in the Department of Drawings, Prints & Graphic Design at Cooper Hewitt, Smithsonian Design Museum.